The wait is now over! 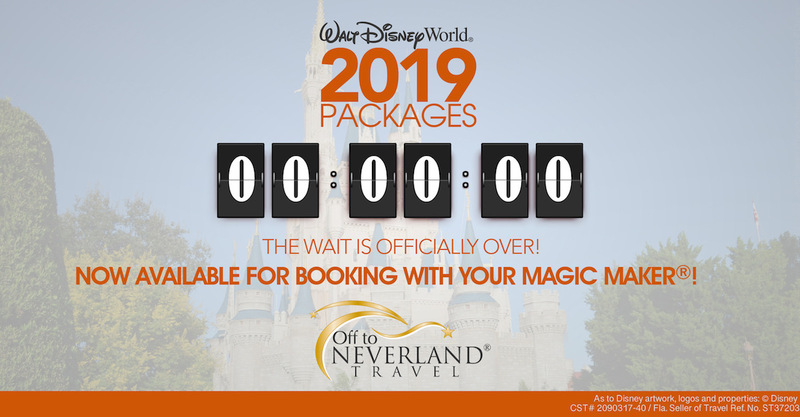 Off to Neverland Travel® is now booking 2019 vacation packages for Walt Disney World® Resort! On June 19th, 2018, The Walt Disney World® Resort opened bookings for 2019 vacation packages for arrivals January 1st through December 31st, 2019. However, because system limitations prevent us from booking stays where the last date of your vacation would be more than 499 days in the future, visits for November and December 2019 won’t be available until later this summer. Introduced in 2018 and continuing for 2019, Magic Your Way Vacation Packages that include a Disney Dining Plan will offer several beverage options during meals*. Guests under 21 can choose (1) non-alcoholic beverage (including specialty beverages where offered). Guests over 21 can choose either one (1) single serving non-alcoholic beverage (including specialty beverages where offered) or one (1) single serving mixed cocktail, beer, or wine (where offered) within their meal entitlement. Merchandise Discounts and/or gifts with purchase at Basin, Crystal Arts by Arribas Brothers, Curl® by Sammy Duvall, Edward Beiner Purveyor of Fine Eyewear, Filthy Rich, Live Trends, Pop Gallery, Something Silver®, Sublime Gifts and Finds, Sugarboo & Co, UGG, and Volcom. Miniature Golf: Four (4) vouchers per package valid for one (1) 18-hole round of miniature golf prior to 4:00 p.m. on one (1) day for ONE (1) Guest at either Disney’s Fantasia Gardens Miniature Golf Course or Disney’s Winter Summerland Miniature Golf Course. ESPN Wide World of Sports Complex: Four (4) vouchers per package valid for one (1) general admission to ESPN Wide World of Sports Complex on one (1) day for ONE (1) Guest. Valid only on event days. Some events require an additional admission charge. Sammy Duvall Water Sports: 10% off the non-discounted price of all activities, including parasailing, waterskiing, wakeboarding, tubing trips and personal watercraft rentals at Sammy Duvall Water Sports Centre located at Disney’s Contemporary Resort. Restrictions apply. Splitsville Luxury Lanes™: Receive 10% off the non-discounted price of bowling (walk-in bowling only); receive 10% on the purchase of food and non-alcoholic beverages (dine-in only); and receive 10% off the non-discounted price of merchandise at Splitsville Luxury Lanes™ located in Disney Springs® West Side. Contact your Magic Maker® today to start planning your 2019 Walt Disney World® Resort Vacation! *Most beer, wine and mixed drink beverages included, some exceptions apply. Guests must be age 21 and over and present valid ID to be served one (1) alcoholic beverage. Alcoholic beverages may only be redeemed with a quick-service or table-service meal entitlement. 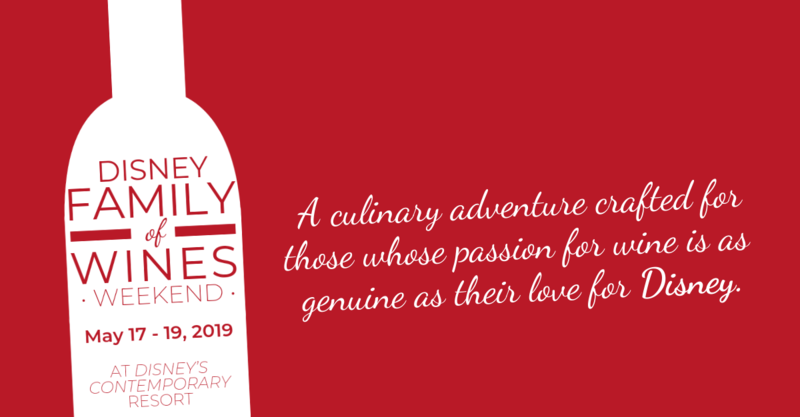 **Benefits are valid for arrivals January 1, 2019 – December 31, 2019. To receive any of the benefits listed, the Magical Extras Savings Card must be presented at time of purchase or a voucher must be presented to the host or hostess at participating locations. Benefits can only be used during your Walt Disney Travel Company package stay and are nontransferable and void if sold. All benefits, services and locations are subject to change without notice. Other restrictions and exclusions may apply. All offers are not valid with any other offer, discount or promotion. Valid for the number of Guests in the package. All dining discounts exclude applicable tax and gratuities. May not be redeemed for cash in whole or in part. Other restrictions may apply. The wait is over! Off to Neverland Travel® is now booking 2015 vacation packages for Walt Disney World® Resort, Disneyland® Resort and Aulani, A Disney Resort & Spa! Our Magic Makers® are able to make reservations for dates in 2015 up to 499 days prior to departure (through Dec. 11, 2015). Travel for dates after will be eligible for booking a bit later in Aug. Contact your Magic Maker® today for a no obligation fee free quote! When you book your Walt Disney World® Resort Vacation Package through the Walt Disney Travel Company and Off to Neverland Travel®, your package comes with several Magical Extras to help make your stay extra special. In past years, those Magical Extras included many different offers – from complimentary arcade credits to food and merchandise vouchers for Planet Hollywood® in Downtown Disney® West Side. Various discounts for select Downtown Disney® merchandise and dining locations. For more information on the Walt Disney World® Resort please contact your Magic Maker®! *Magical Extras are subject to change and are only included in Walt Disney World® Resort Vacation Packages booked through the Walt Disney Travel Company. Some restrictions apply. See travel documents for complete details on offers. 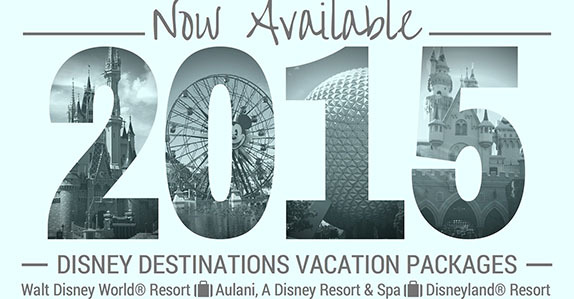 Walt Disney World® Resort page for current offers. Through Mar. 29, 2008, when you purchase a 4-night, 4-day non-discounted Walt Disney Travel Company Magic Your Way package you’ll get three additional nights (with tickets) free. This offer is now valid for stays most nights Feb. 15 – March 9, March 17 – April 4 and April 19 – Aug. 15, 2009. 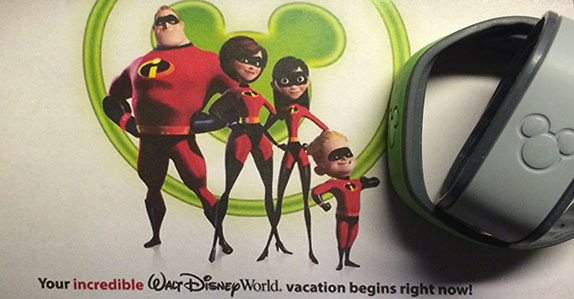 Plus, if you travel on this package between March 1 – March 8 and March 22 – March 29, 2009, you’ll also receive a Disney Gift Card worth $200 that you can choose to spend at the Walt Disney World® Resort during your stay. And, those taking advantage of this offer at Disney’s Old Key West Resort or Disney’s Saratoga Springs Resort & Spa will receive a $100 Disney Gift Card**, available for arrivals beginning March 30 – April 1 and April 19 – Aug. 15, 2009. Click here to request a no-obligation quote for this incredible package! This holiday season is the perfect time for you to visit the Walt Disney World® Resort. That’s because you can stay at a select Walt Disney World® Resort hotel at an unforgettable rate. When you take advantage of this great rate, your Walt Disney World® Resort vacation will take place during one of the most unforgettable times of the year and you’ll have the chance to witness some spectacular, can’t-miss seasonal traditions, such as the Epcot® International Food & Wine Festival, Mickey’s Not-So-Scary Halloween Party†, The Osborne Family Spectacle of Dancing Lights, Mickey’s Very Merry Christmas Party† and a whole lot more! This rate is too good to pass up and must be booked by Oct. 18, 2008, so hurry up and book before it’s too late. Don’t miss out on this incredible opportunity to save! *The number of rooms available at these rates is limited. Savings based on the non-discounted price for the same room. Additional per adult charges apply if more than two adults per room. No group rates or other discounts apply. Advance reservations required. †Admission to this event requires a separate ticket. 2009 Walt Disney World® Resort vacation packages are now available to book through Off to Neverland Travel®. 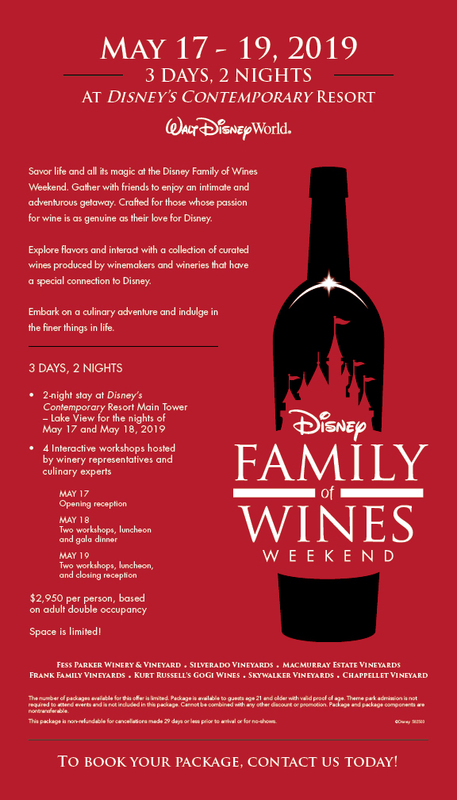 These packages feature a brand-new dining option, great savings and exclusive benefits that only Disney can provide. Ready to book your 2009 package? The fun starts by clicking here. Resort Refillable Drink Mug – 1 per person, per package. 30 Minute Arcade Game Card – Each 2009 package comes with a 30 minute arcade game card. One card per room valid for 30 minutes of arcade game play. Not valid for games with prizes or photo booths. May only be used in arcades located in Disney Resort hotels. Card has no cash value and unused time is not refundable.